At Falcon Energy, we understand the importance of sustainable, energy friendly properties and buildings. Thermographic testing is just one of our services whereby our expert team test for and report on the likes of poor insulation or roof damage that could cause energy loss. We're here to ensure your property, whether it's your home or business place, is as environmentally friendly and energy-efficient as possible. We work throughout the UK including West/East Sussex, Surrey, Kent and surrounding areas, advising on renewable energy and installations. 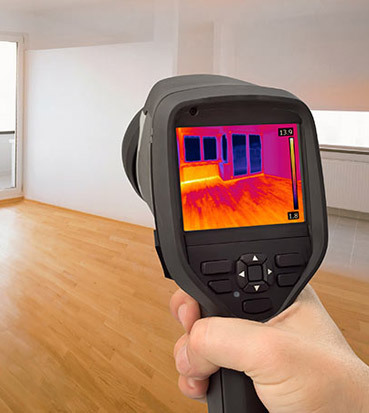 Thermographic Testing uses an infrared camera to identify hot or cold areas on a property whereby energy and heat may be lost or inefficiently used. By carrying out this type of infrared survey on your property, Falcon Energy can determine unnecessary energy inefficiency and can manage any subsequent repairs or solutions that could not only make the building more environmentally friendly but could reduce your energy and utility bills at the same time. Why is Thermographic Testing important? As a property owner, you are responsible for ensuring you're doing everything in your power to reduce costs and energy waste where possible; effective surveying and reporting is the solution. Through conducting a professional and thorough Thermographic Test on your property, we can identify how best to make your home or business place more energy efficient and consequently, less costly in terms of utility bills. With sustainability at the forefront of everyone's minds, a Thermographic Test by Falcon Energy is a step in the right direction to ensuring optimal energy efficiency. Thermographic imaging is a test to discover radiant energy being released by a surface and to evidence any ‘heat loss’ in a property. It is achieved by using infrared cameras (which measure infrared radiation - ‘radiant energy’ - being emitted by a surface) to diagnose and locate insulation voids, air leaks, moisture intrusion, thermal bypasses, and thermal bridges in a property, without needing to open up walls or ceilings for inspection. It requires specialist equipment, including infrared cameras, thermographic scanners, and thermal imaging devices. The images produced - known as thermograms - are then evaluated by a trained thermographer. It has been used by energy auditors and contractors for over 30 years and is the industry standard. It can also be used to find leaks in hydronic tubing embedded in a slab. What’s required for the test to be carried out? For the most accurate results to act on, a 10°C temperature difference between the inside and outside of the property must be achieved for a minimum of 24 hours prior to the survey if occupied, or 72 hours for an empty building. If the building doesn’t have a heating system or has a non-operational heating system, temporary direct heaters may be utilised. What can you expect from the resulting survey? You will be given a precise and detailed report once the survey is completed. The report will include all of our findings, as well as comments and advice from thermographers on any improvements and long term strategies to be applied. The thermographers producing these reports will be level 2 or above, ensuring quality and comprehensive advice. What happens once you receive the survey? The team at Falcon Energy are available to discuss the findings and explain any aspects that may be unclear in your thermal data report. With year's of experience in the energy efficiency industry, and a glowing reputation across the South East, Falcon Energy are on hand to deliver the very best, bespoke Thermographic Test for your property. We'll work with minimum disruption and will explain our efforts every step of the way; you can rest assured we'll keep you in the loop and will keep costs to a minimum. Call us now on 01403 253439 or email info@falconenergy.co.uk to arrange your Thermographic Testing today.